Back again! Thank you all for your lovely comments on the deer box and dear Meari's mailart. After looking through my finishes of 2013, I noticed I have not done as many as the year before. However, it seems that 2013 was the year of box finishes for me. I completed a total of 5 box finishes! Thanks to Angela and Terri who inspired me in the first place, I tackled my first box and got hooked!! You will only see 4 though since 1 hasn't been received yet. Pillow finishes won by majority this year with a new mailart finish. Next year I hope to do a few more pinkeeps and perhaps try some new ways of finishing. I always like to experiment, even though the outcome may not be how I imagined it! Two other finishes did not make it into the collage as they too have yet to be received!! I only finished one BAP...Hannah. Here she is again. She is still waiting to be framed. We found this really cool copper frame in the basement of my hubby's shelter that had been abandoned and we thought it would work for her. Unfortunately, the frame is too small and would cut off the pretty border. Too bad since it is the coolest frame. Now I have to stitch something to fit in the frame!! Here are my current WIP's going forward. And last but not least, poor old Tea Bath Fairy. I think the last time I worked on her was in March. I would like to have her finished in 2014. I realized I stopped because all of that white space needs to be filled with metallic thread....something I'm not a big fan of stitching with. 2013 has also been the year of crocheting. 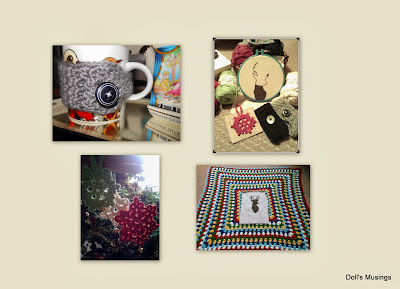 I got hooked, literally, into making mug cozies, snowflakes and putting rounds into my afghan. I made a total of 6 mug cozies and about a dozen snowflakes. I forgot to take photos but you get the idea!! Quilts....I started the jelly roll quilt and have yet to finish it. I am a big chicken...like Titus!! I have been thinking about cutting the panels to make the borders but don't want to make an error so there it sits...staring at me...taunting me. Then I look around at people's blogs and see beautiful quilts people whip up...well, perhaps not that fast, but they have no fear!! I so wish I had someone who could guide me and encourage me to take up the shears and snip! I'm enlisting my dear hubby to help me with the cutting. He thinks he can't help, but I know he can since I can't sew or cut straight, but I believe he can. There she is...unfinished. Give me courage!!! Wishes for 2014: Two only. One, for my husband to get better. Two, for a child. Please pray for us on both accounts. I think I can't complete a post without some Titus photos. His favourite things to do...roll around on mom's stuff and sniff. A big thanks to all of you for your constant support, well wishes, prayers, good thoughts, and well just being the best stitchy friends ever. I have made so many wonderful new friendships since I started blogging and I have been blessed to "meet" you all. I wish all of the best in 2014 for all of you!! Lovely post, Anne, love all of your finishes for 2013 and I wish for you that both of your wishes come true. Happy New Year, my dear friend. What beautiful stitching and crocheting you have done in 2013. Your quilt is beautiful. I can understand that you are scared to go forward with it in case you make an error (I would be too). However, I am sure if you take it slowly you will be just fine! Wishing your hubby all the best with his health, and I hope you are both blessed with a baby very, very soon! Titus just gets more and more handsome with each blog post. Lovely seeing your projects all together!! Titus is such a ham ~ love seeing him! Sending good thoughts and prayers that both of your wishes come true!! You've had quite the productive year! LOVE your box finishes. I can understand wanting to have someone nearby while cutting borders for the first time. Do you have a quilting friend nearby? Or a quilt shop? If not, watch some YouTube videos and just do it. I find that it's never as bad as I've built it up to be. You can do this! 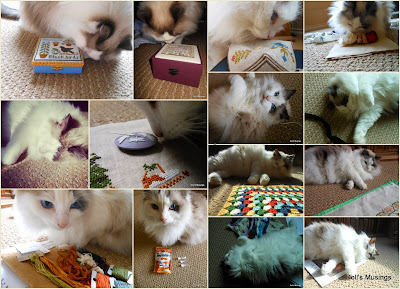 You've had a wonderful year stitching-wise. I hope your wishes will be fulfilled in 2014. ROTFL! That pic of Titus just cracks me up! I love seeing all your finishes from this year! Beautiful, all, especially Hannah! Too bad about that frame. I hope your wishes for 2014 come true. We tried for a baby for a long time -- I remember what it's like. Good luck! And Happy New Year! Great post Anne. Love the pics of Titus. If I could grant wishes, I would be sure to fulfill yours. Sending you good wishes for a great new year. What a great post! Titus is just cute and your finishes are great. Here's hoping all your wishes come true in 2014! Happy New Year! Happy New Year. The cat picture made me laugh. My dear Anne, Happy New Year to you and your two "boys"! You've had a very busy productive year, what with all the work that's been taking up so much time, you did great! I know there aren't many quilt shops around but The Cloth Shop is now down on Granville Island and I know they can help you if you have quilting questions. Also, in the past, they had classroom space and you could use it if you need help with cutting etc. Anyway it doesn't hurt to ask. Great finishes in 2013! Hopefully you'll have more beautiful pieces in 2014, and that both of your wishes come true. :D Happy New Year! Beautiful finishes . You can finish that quilt! Beautiful finishes my friend! Also beautiful quilting & crochet! Sophie enjoyed seeing all the photos of Titus but that last one cracked her up : ) Praying that your husband gets better & that you are both blessed with a child. Happy New Year! What a beautiful post, love all your stitching . Sending you my love and hoping everyone of your wishes come true , hugs. I am so glad we have become better friends. You are such a sweetie for answering so many of my questions and being so encouraging. May God richly bless you both in this new year! 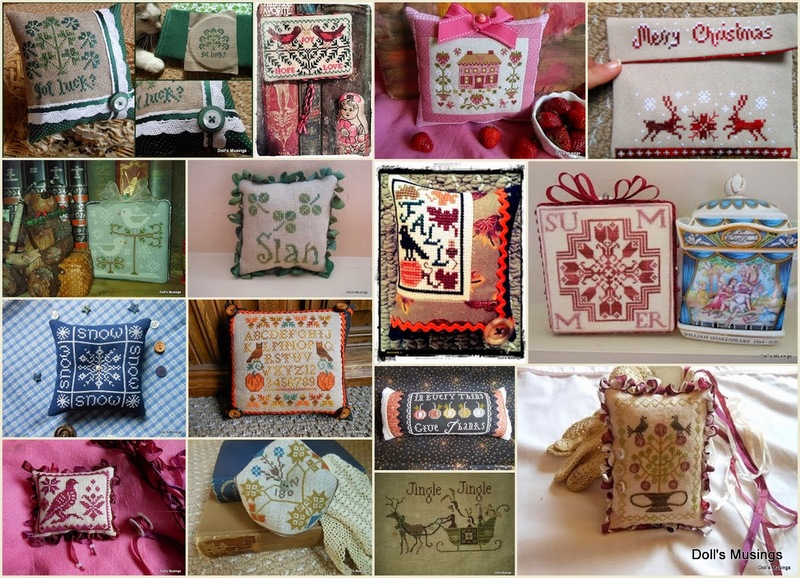 Beautiful crafting during 2013, hope to see more of the same in 2014. Best wishes for your husbands health and fingers crossed for the gift of a child. And the same to you Anne, a lovely post to read. Beautiful work, Anne....and so much of it too!Great to see it all like this. Hoping that your wishes come true this year. What a feast for the eyes, Anne! Quite a lot of lovely work this year! I got such a good laugh at Titus sporting his Vampire Prince look! What in the world happened to his fur? :D I will certainly be praying for your wishes to come true this year!! Happy New Year! I would say you had a majorly productive year! Always beautiful, your finishes inspire! I will keep You in prayer and hope that 2014 brings good health to your DH, and a baby for you both to love! You had a very productive 2013, looking forward to more of your beautiful works in 2014! Sending you prayers and best wishes for 2014! May your wishes and dreams come true! The quilt is so pretty (as are everything else! ), you should definitely keep at it. I have a quilt top sitting around here too; I really hope to muster up the energy to finish it in 2014 as I'm getting tired of moving it from place to place in my fabric cupboard! Happy New Year! I will keep you and your husband in my thoughts this year! I've witnessed some miracles in the last year with friends who want children so keep positive! You've had plenty of beautiful finishes in 2013 and I know you're going to have a lot more in 2014. I loved this year in review! Titus the vampire is my favorite as well. My health took months to get under control last year, so I sympathize with your husband. I will keep you both in my thoughts and hope that a wee one will join your family too! Here is to an exciting year! Oh, I forgot! When I started quilting I used a pattern series called "turning twenty" they make super cute, fast and easy quilts. You do lovely stitching and I love seeing it! Prayers for you and your hubby! What amazing finishes you had for 2013! 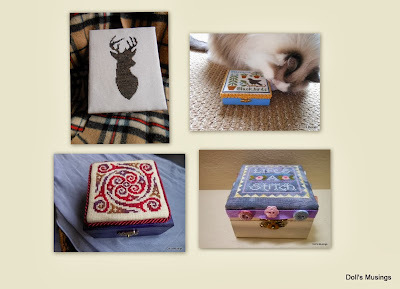 Those boxes are beautiful and I love the deer box and the Life's a stitch box in particular. Thanks for stopping by my blog and Happy New Year to you! 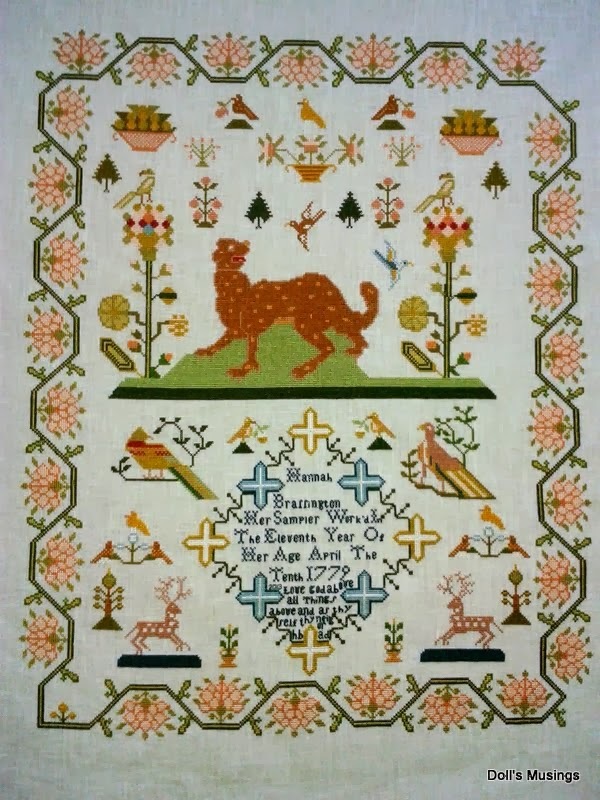 You have been very busy this past year with all that lovely cross stitch and crochet. I look forward to seeing what projects you will be working on this year. What a wonderful productive year you had - all those great projects, beautifully stitched and finished. I am also a fan of those small pillows and most of my finishes become small pillows. I have never tried myself on a box and should include this in this year's finishing plans. I can fully undedstand you on your fear of cutting fabric for a quilt. I'm exactly the same but I once had a bad experience cutting pieces of fabric without seam allowances. Oh well. So now I measure twice or even more often before I take the scissors in my hands, lol. Stitching on some of my WIPs/UFOs is also among my plans. But I can't stay away from new starts. Never, lol. Have a great new year and I hope that both your wishes will be fulfilled. You and your family will be in my prayers - may your wishes come true. Fabulous accomplishments for 2013. So many pretty finishes. I am wishing for both of those things for you and your DH. You've got some lovely things finished last year. Great finishes and stitching here. I love all the boxes you made. My finishes have mainly been "stick it in the scrapbook and make a page of it!" Or little bags so I don't have to stuff them and do that awkward finishing the top neatly. And you're TTC!! good luck. Wish I could send you some of my fertility. Or even one of my children LOL. But only on a bad day!! You have been VERY Busy this past year! Lots finished! May all of the Blessings God has in mind for you, happen! Love the photos of Titus! 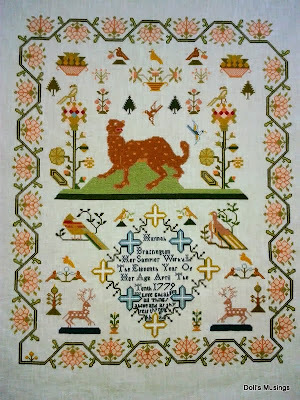 Victorian Motto Sampler Shoppe Floss Giveaway! !